Gauguin's style has been classified as Post-Impressionist, Synthetist and Symbolist. A renowned innovator, Gauguin experimented, invented and mastered a host of new styles during his career. He is a highly influential founding father of modern art, and is widely acknowledged as the artist who did the most to break through the traditions of Western naturalism. Gauguin's style stresses linear patterns and color harmonies, which provoke a unique sense of the unknown. His obsession with the primitive instigated his woodcutting, whose works are distinctive through their irregular shapes and contrasts. Although most of Gauguin's major artistic achievements were to be achieved within other artistic fields, his early style was firmly rooted in Impressionism. His attitudes towards art were heavily influenced by witnessing its first exhibition and he participated in Impressionist exhibitions in 1880, 1881 and 1882. Gauguin's early style is marked with solidity in form and unnatural colors. After the stock market crash of 1882, Gauguin moved to Rouen and then to Pont Aven, a notorious resort for artists. 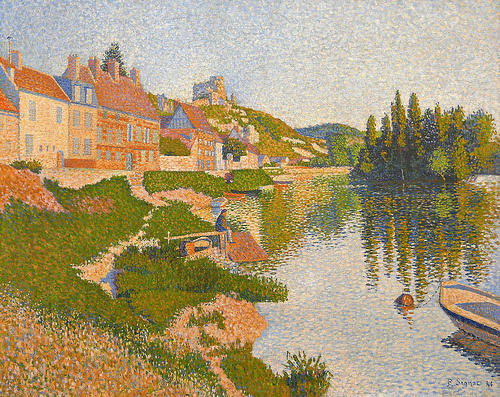 In Pont-Aven Gauguin stopped working exclusively outdoors and began to adopt a more independent line. Influences during this time included van Gogh, Seurat, Signac and Degas, who all served to produce a style with very little in common with traditional Impressionism. The paintings by Gauguin during his Synthetist stage reveal an overall simplification in subject matter. The style is intensely spiritual towards the subject and is depicted with an exaggeratedly expressive use of color. Gauguin employed bright areas of color with heavy, dark outlines in his series of Breton landscapes. This style gives the painting the appearance of medieval enamel and stained-glass work and often depicted the people and normal, everyday activity of the people of Breton. The members of the Synthetist group (Pont-Aven school) met regularly to discuss new developments in French art, in particular Symbolism. In 1889 Gauguin arranged and exhibition of Impressionist and Synthetist art that featured his and other's works. Gauguin's move to Arles to work with Van Gogh in 1888 also marked a development in artistic style. Gauguin increasingly abandoned imitative art for expression through color. His work there has been classified as Post-Impressionist because it shows an individual, personal development in its use of color, brushstroke and non-traditional subject matter. 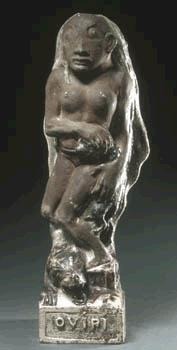 This rough technique also manifests itself closer to the primitive ideal, which would completely characterize Gauguin's latter works. 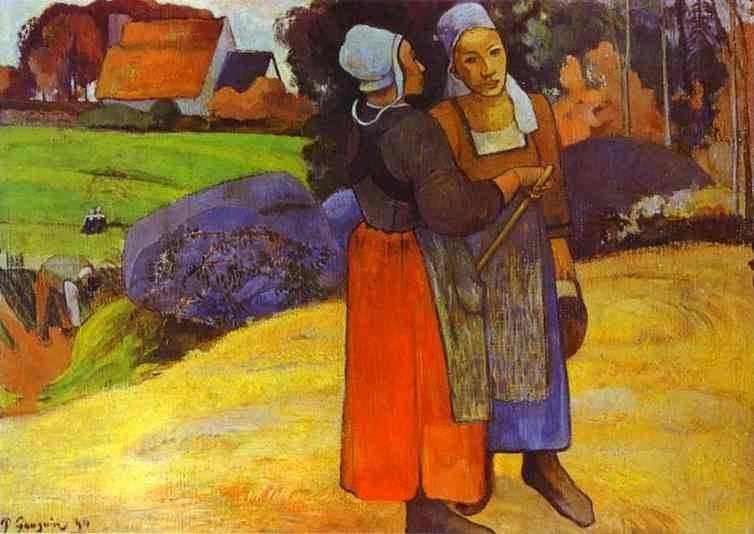 Gauguin's final stylistic phase required his complete removal from Western society in search of a primitive ideal. After moving to the South Pacific, Gauguin made sculptures and woodcuts of Polynesian and Maori gods with a deliberate rough-hewn look. This primitive style was interspersed with more poetic images developed with arranged tonal harmonies as seen in Where Do We Come From? What Are We? Where Are We Going? His paintings of primitive art are characterized by flat forms and the violent colors belonging to an untamed nature. These would be transferred onto canvas. Despite this, his overall tones were muted, and quite close together. "Pure color! Everything must be sacrificed to it." 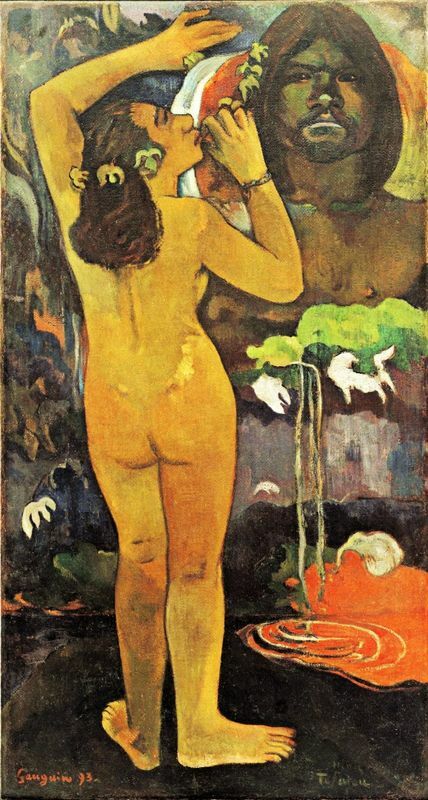 Gauguin's painting technique is distinctive in the use of thick, bold, expressionistic brushstrokes. Gauguin often added wax to his paints to give them extra smoothness and flow, and the paint used is thin, being thinnest at the edges of forms where colors such as Prussian or cobalt blue and earth red is used to strengthen the shapes. 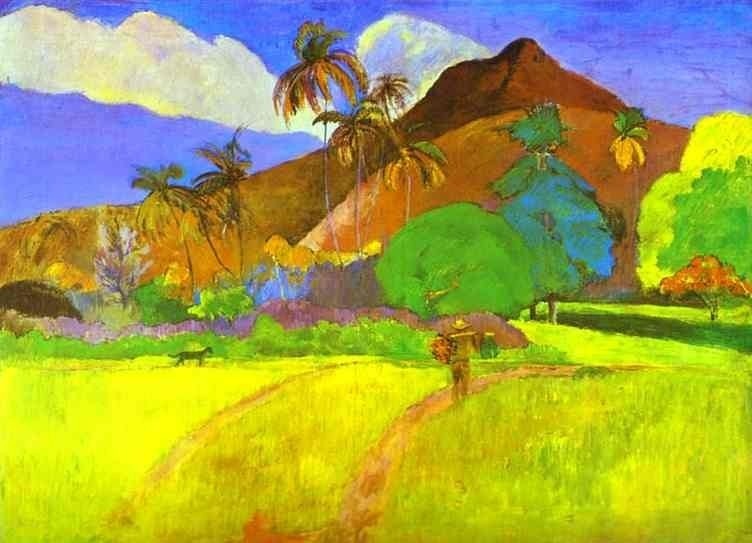 A palette discovered in his painting studio after he died suggests that Gauguin didn't put out his colors in any particular order. Nor did he clean his palette, instead mixing fresh colors on top of already dried up paint. During his time in Tahiti, Gauguin painted on unprimed hessian, and in many paintings the weave of the rough fabric is clearly visible through the paint. This was partly as a result of his thin paints and inability to pay for better materials, but also because the hairy surfaces of the sackcloth enhanced the primitive qualities he was looking for.